Phewwwww, thank God that is done. Another Challenge Card -- are you surprised? Another Christmas Card with Non traditional colors. This snowman is long retired but still one of my favorites. The base of the card is Soft Sky. The next layer is Basic Grey with the Snow jumbo wheel rolled across in Going Grey ink on top. The bottom of the grey paper has the little snowflake from Perfect Presentation stamped on it in Going Grey. Next is a strip of Basic Black that has been paper pierced along the edges. I layered a piece of designer paper from the Soft Sky Prints collections on the black piece. The snowman is stamped on Whisper White with Basic Black ink and layered on Real Red. I colored around the edges with Going Grey marker to highlight. I also chalked an oval around the bottom of him with a mask made from our oval punch. The hat and heart are paper pieced with paper from the Winter Bright Simply Scrappin Kit. His nose and scarf are colored using markers. The final piece is the little black scallop circle with the snowflake from Season of Joy stamped in Soft Sky on Whisper White. This is hung from basic black grosgrain ribbon with silver cording. I added a piece of red polka dot ribbon and a red stone to finish. I hope you enjoyed. You only have until 5 days so order fast. Stampin' Up! is offering the Wishing You Cheer set at 20% OFF until November 3rd! It is such a cute set I know I am ordering it, are you. Let me know before 8pm on the 3rd so I can get you in on the special! I tried all day yesterday and bit on Saturday to upload this card but Blooger what not being very cooperative. Oh well, at least it is working this morning. This card is so pretty in person. The background is actually our Blizzard Wrapping paper. The angel is from Holy Triptych and stamped on Shimmery White card stock. The saying is from Star Studded Season and stamped on Bashful Blue card stock in Chocolate Chip. All three of these items are found in the Holiday Mini which runs till the end of November. I colored the angel with a bashful blue watercolor crayon. Here hair is colored with the aqua painter and color from the lid of the Chocolate Chip pad. I added dazzling diamonds to the wings with the SU glue pen. Very pretty in person. During the month of November, purchase three packs of our Designer Series Papers and receive one pack absolutely FREE!!! Yep, that read on pack free! The paper packs are $9.95 so that is a substantial savings. You all know that I have begun to use these a ton so I will be stocking up on a few of my favorites before the retirement list -- Yikes that sounds weird this time of year. Don't forget the new catalog is due out in January. So much to buy yet, lol! Our Designer Series Papers are 12x12, patterned on both sides and come twelve sheets to a pack. You can find these papers on pages 170-173 of the Fall-Winter Catalog and pages 12 and 19 of the Holiday Mini Catalog. Here is a list of the papers and their coordinating card stock and ink colors: I have this printed out and hanging near my paper in my studio- you may want to do that too. So let me know what papers you want for free! I LOVE that word! Wow! It has been 5 days since my last post. Sorry about that but I am sure you all know how it is when life gets busy. That is my longest break yet. Anyway, this weeks challenge comes at a perfect time. We have been challenged to use designer paper and during November Stampin Up! is offering a great special on their designer paper so get your orders ready -- and call me, lol! I created a pretty large Christmas decoration for my craft room. I hope you like it. I had a really hard time with the picture, I should have set it up better and cleaned up around it but was in a rush so this is what I got. This is a close up of the top of the tree. All of the designer paper used is from the Winter Brights Simply Scrappin kit. I also used Real Red, Bashful Blue and Wild Wasabi card stock to alternate. The garland and ornaments have been in my craft room for years -- nice to finally use them. As was the paper tree I started with. All of the papers are just folded in a loose loop and stapled together before attaching to the form. This project is usually done with a Styrofoam cone which would have been much easier because you could just use pins to adhere the paper loops. This took about 7 different adhesives, lol! There were a lot of uneven areas on the tree as it was really textured to start with. Here is a link for where I got the idea. I did not use these cones though. My tree is two and a half feet hight! Isn't this the cutest thing. I really like the wreath semi suspended. I was at my LSS yesterday and seen a card like this. I seen so much I really don't remember most but this layout stuck in my head so here it is to hopefully stick in your head. Very easy to do too. Supplies used: Winter brights paper,Wild Wasabi card stock, Real Red card stock, Whisper White card stock that has been cuttlebugged with the swirls, scallop punch, small circle punch , small flower from Season of Joy, red sticklers, Wild Wasabi ink, Basic Black ink and saying from Many Merry Messages. The wreath is created twice and then stuck together with the white cardstock in between to suspend the wreath. This also makes it look nice from the inside. Thanks for stopping by and checking out my blog today! Today's Splitcoaststamper Limited Supply Challenge was to create a fast and elegant card using only the following supplies. I decided to cut a window in the front of the card. The base of the card is Sky Blue textured card stock. I cut a square window in the front of the card and stamped the swirl from Season of Joy on all four sides in Blue Bayou. I added little hand drawn doodles around the window with a black marker. The words are from Absolutely Fabulous and are stamped in Blue Bayou. I added a line of pierced holes from the word over toward the other side. The wide ribbon has been in my stash for years! No clue where it is from. On the inside of the card Is a layer of Whisper White that I stamped the flowers from the retired set Happy Harmony in Blue Bayou and the saying -- In Everything Give Thanks -- in black. One more thank you card done! This weeks challenge was "Inspired By". Well I was inspired -- as I often am -- by Diane over at Stamp With Diane. She had this brilliant idea for a hand made -- hand stamped photo card! I thought this was the best thing I have seen in a long time! So many people want to make home made cards but decide against it because they want a photo card. Well, here is the best of both worlds! How much more personal can your Christmas Cards get? My sample showcases a very old picture of my son. He was one at the time he is now seven. This was when he got his new puppy for Christmas! This is also the only year that we sent out photo cards because I always want to make them -- man am I excited about this year! Thanks Diane. Here is the card shown closed. This is a close up of the "card" part. So easy to work with, kind of like trading cards. These will certainly be easy to whip out -- even if you change the image on every card you make. Did I tell you I love this idea! This picture shows how the card opens. Supplies used for the card. Real Red 12 x 12 textured card stock is used for the base. I also used Wild Wasabi, Summer Sun and Whisper White cards stock. The image is from the hostess set Perfect Presentation. I stamped it on the white, wasabi and real red and then cut it out and pieced it together. The star, saying and the swirl are all from the Season of Joy set from the Holiday mini. I also used a saying from Many Merry Messages on the inside. I kept it simple so that the picture will be the real focal point. Hope you enjoy. I am gonna have to figure out how to get one seven year old two dogs and a cat to sit still for pictures, lol. Another one of those cards from last year. I created it, cut the paper and then never made it. The challenge on Splitcoaststampers today was to use wood! Yea, I pulled out the materials and made 11 of these in no time at all. The base of the card is Real Red. Next layer is Whisper White and has the retired Polar Bears stamped in Black along with the snowflakes. I only colored the scarves and ground because I wanted to keep it simple. The wood star is painted yellow and then has thin red ribbon wrapped around it. The word Believe is stamped in Real Red. It is from the retired Hope Is set. Got to love fast and fun cards! Feels good to be back in the studio creating. I have lots of thank you cards to make for all the people that helped me with the Crop Walk. Here are my first two. Both used the sketch above from Splitcoaststampers. Hope you like them. This first card is so bright and cheery I just love it. I used the Cutie Pie designer series paper along with Rose Red and Bashful Blue card stock. The first layer of paper that is on the Real Red card base is the polka dots. I stamped thanks from the retired Autumn Leaf Prints set in black randomly over the dots. Next is a piece of Bashful blue card stock that has a slight scallop edge on the top. I also cut the next layer of designer paper with the same scallop edge. I did not line them up perfect because I liked this look better. I added a strip of saffron strip of scallop sticker from the Friends and Family simply scrappin kit along the bottom of the designer paper. Then I did some paper piercing on the blue line along the bottom of the strip. The focal image from Sidekick Sayings is stamped on Whisper White and colored in with markers. I highlighted the words grateful and happy. Then it is layered on a piece of Rose Red card stock that has been paper pierced on both sides. I finished it off with more of the So Saffron sticker strip. The entire focal image is popped up on dimensionals. I love the colors. This second card is done with the retired set Reverse Prints. I embossed the image with dark brown powder on River Rock. It is then layered on Old Olive and then Chocolate Chip. Other items used are the square steps punch, brown brads,the dry brush jumbo wheel, versa mark, and Simple Sayings II. Thanks for stopping by. Sorry about the few days with no post. I took over the coordinator position for our local Crop Walk (Communities Responding To Overcome Poverty) and the Walk was this Sunday. I had tons of details to get done so I have not been in my studio since Friday! Yikes. The Crop Walk went well and now I just need to do the final details and send the money on to help feed the hungry. 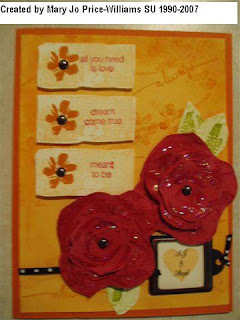 So since I have not stamped in a few days I thought I would share this card I did a while ago for a challenge. The challenge was to create a Black and White card. This is actually a tri-fold card. 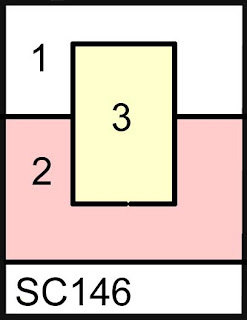 The white opens in the opposite direction as the front of the card. I used the Doodle this and Doodle that sets. I am not going into all the details tonight. Maybe I will update this tomorrow when I am not so tired. If you have any questions feel free to post them here and I will answer promptly. Thanks for stopping by and I promise to have something new tomorrow. I can not wait to see all the other ornaments that the rest of the group made.. This is such a fun challenge. I created this big 12 x 12 snowflake ornament. It was quite fun to do and I actually did a tutorial for you too! You will find that in the previous post. I used the Wintergreen designer series paper, scallop circle punch, cording, Scotch Quick-Dry Adhesive and beads. You can not really see the little scallop ornament with the beads hanging off if you don't look close. So go ahead and look close! Not at the background mess though. Don't forget to look at my side bar to find the links to all the other players. This should be a fun one. Thanks for stopping by today. It is very hard to get a good picture of this because I have no where to hang it that the back ground is not a mess, lol. So just remember that I don't have time for housework and yard work if I am gonna be stampin for you guys all the time, teehee. Supplies needed for this project (not all are shown in the picture) 6 squares of double sided designer paper (or white for traditional snowflakes). All squares must be the same size. Mine are 6 inch squares of the Wintergreen designer paper. 6 small scallop circles (from the Stampin Up! scallop circle punch) of the same or coordinating paper. Scissors, cording, scotch quick-dry adhesive, ruler, pencil and stapler. Beads are optional. We will begin with the large part of the ornament -- the snowflake. Take one of your square pieces of of paper and fold it in half from corner to corner. Keep the lighter side showing so that you can make pencil marks for cutting. Now fold it in half again so that you have a small triangle as seen below. Next you will need to open it back to the original fold. Place your paper with the folded edge on top and the point on bottom Now measure from the center point on top to the outer straight edge that does not have a fold on it. Since my paper is 6 x 6 square I found the spot that measures 3 inches from center to edge. See below. I marked small lines at 1 and 3/8, 1 and 7/8 and 2 and 3/8. The lines must go from crease to crease. Using your markings you will need to draw a straight line from the crease that is in the middle of your paper to the top folded edge. When you have the lines drawn fold your paper back to the way it is shown in the picture below. The lines will only be on one quarter of your paper. Next you will need to cut on the lines you just drew. But the trick is to start at the end that opens and cut almost up to the solid fold. You need to leave about 1/4 inch before the solid fold line. Look at photos below. This is what your paper will look like after you cut your three lines. This is what your paper will look like when it is fully open. If you have made it to this point you have completed the hardest part of the project. Unfortunately you will need to do this and the following steps to all 6 square pieces of paper. I suggest you continue on with the next few steps before cutting any more of your squares though so you are sure your cuts are right. Now with your paper open in front of you you will want to grab the two corners of the inside square and roll them to meet each other as seen below. Add some adhesive to one corner and attach together. This adhesive dries fast and stays put! Here is what your paper should look like now. So far so good? Now flip your paper over so that the first loop is now facing down. See below. Grab the two corners of the next square and bring them together in this direction. Again you will need to apply adhesive and attach the corners together. Flip your paper again and do it with the next two corners. When all the corners are alternating and attached set aside and do the same thing to your other five squares. After that you will have six separate "arms" for your snowflake ornament. Take the corner of three of your "arms" and hold them together to create a point as shown below. Use your stapler to place a staple on this point to keep the tree "arms" together. Do the same to the other three "arms"
Carefully attach the two points that are stapled together and add one more staple to that to form the middle of your snowflake ornament. Last step to this part of your ornament is to staple where the 6 "arms" meet. This will help the snowflake to keep it's shape. Pick a point to be the top of your snow flake and punch a small hole in it to string some cording to use for hanging it. Then punch a small hole in the bottom to prepare for the small ornament that attaches to the bottom. Set your snowflake aside for a few minutes and bring over your 6 small scallop circles of matching paper. This will create the mini ornament that is hanging on the bottom of the snowflake. Fold each scallop in half alternating the patterns as seen below. Begin to glue each scallop to an alternating scallop. As you attach one you will fold it over and add the next one right next onto the others. Here is a picture of the process. Before attaching the last scallops together I took a piece of cording and tied a knot in one end. I added two coordinating beads and then strung it across the scallop ornament and through the hole on my snowflake and then back down to the mini scallop ornament. I taped the cording to the mini scallop ornament and then glued it together. Well, the good news is I am back up and running with my yourrep@roadrunner e-mail, the bad news is if you e-mailed me over the last few days I did not get it. So if you did please try again. Thanks. Now for the card. Another challenge--this is a one on one challenge swap. We had to make one of these criss cross cards. This is mine. I hope she likes it. The belly strip is not all the way on so it looks crooked, sorry. Paper: Bashful Blue, Basic Black, So Saffron, Certainly Celery and Rose Red card stock. Cutie Pie designer series paper. Other. paper piercer and mat, black marker, rose ribbon, wave cutting blade, black embossing powder, dimentionals, paper snips, corner rounder and round tab punch. Stamp sets: Simply Said, Word on Word and Doodle This. These beautiful cards were created by three of my friends who just happen to be club members. Didn't they do a great job. I cut the main pieces for them and they all embellished as they chose. I think they all turned out great. Super job Michelle, Laura and Jen! I have spent the last day and a half on the phone with my Internet provider. You see they some how, accidentally???? deleted my e-mail account! Yep, they erased all my e-mails and deleted my account completely! And what do they say you may ask, "We are sorry. But you can not get that same e-mail back for about a month and there is nothing we can do about the lost e-mails. Thanks for being a loyal customer for the past 15 years!" WHAT???? So this explains my having a phone glued to my ear for almost two days now! Yikes. Needless to say I can not stamp with a phone in my hand so I found an older sample to share. I am exhausted so I am just sharing the picture and will be happy to answer any question you may have later. You will need to post your questions here though since I have no e-mail for a couple of days -- at least they now say a couple of days. (that is better than when I started this whole thing and they said at least a month!) We will see. This card was made for friends of mine for their wedding day. I love the colors and I so love the retired set Roses in Winter. Papers, Pumpkin Pie, Apricot Appeal, Ruby Red and Vanilla. Ink same plus black and Old Olive. Sorry for the lame description but I am way way way tired. Every other word is being spelled wrong. This was for a Feature Stamper Challenge on SCS. This is a cool challenge because it actually makes your case someones card without feeling guilty, lol. This card is not even close to as pretty as the original that can be found here. But I wanted to tone it down a bit and use it for my all occasion class tomorrow night. Besides the fact that I could not (even if I tried) created a image as beautifully colored as SweetMissDaisy. I did change a few things on mine. The colors are Blue Bayou, Chocolate Chip and River Rock. Stamp Sets used: Retired Natural Beauty, Season of Joy, Retired Warmest Regards and Linen Background. Other supplies used: Blender Pen, Watercolor crayons, H2O pen, paper piercer, twill tape, chocolate chip brads, dark brown embossing powder, blue bayou, versamark and sahara sand ink and white gel pen. Got to go to church so that is it for now. Hope you enjoyed, and as always -- thanks for stopping by today.